We’ve been doing some photography at Kiva Gallery in order to take stock of the gallery’s collection and put together and much needed database of quality images. Going through all the work in the gallery is a great opportunity to fall in love all over again with the art. We are letting the process take its time so we can study the paintings, sculptures and textiles up close. With the help of zoom lenses one can get into details on an almost microscopic level. You discover things that’s not available to the naked eye. Mateo Romero’s paintings have proven particularly rewarding to put through this process. 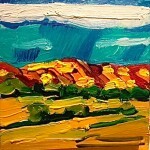 Mateo Romero’s recent focus on landscape is such a logical step considering his treatment of paint. That he takes landscape as motif is one thing, but with Romero you always get two paintings in one. 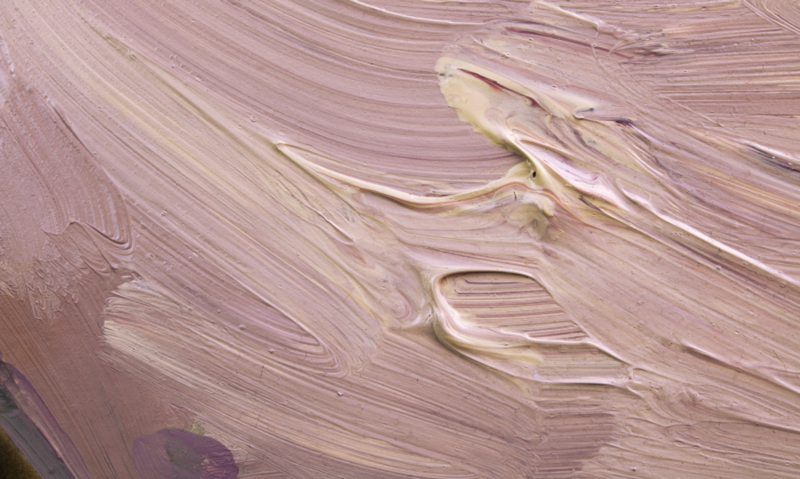 Beyond the subject matter there is a dimension of pure paint that demands to be experienced on its own terms. And once you enter this dimension you go through what can only be described as the bliss of pure art. Like modernism’s star theorist Clement Greenberg, Mateo Romero knows that painting a good story does not alone a good painting make. Of course, there is plenty of narrative content in a Romero. But there is also another side to Romero, one that sets its sights on abstraction. This is the side that would appeal to Greenberg because it is here that Romero indulges in the modernist imperative to explore what constitutes painting as an art form, i.e. the paint itself, and the power it holds to be a vehicle for emotion. One can clearly see the importance Romero imparts to paint in “Girl with a Gun”. 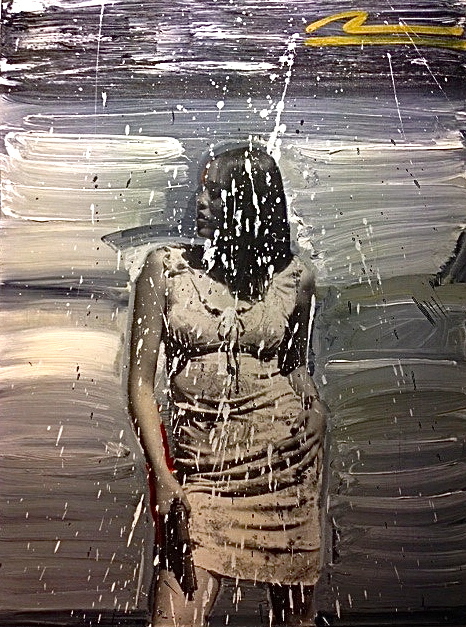 Aside from the figurative content, which is the expected source of suspense considering there is a gun involved, tension and drama is here conveyed primarily through paint. Unlike other paintings by Romero, there is a strict, almost dichotomous, protocol to the distribution of paint that tells it’s own wordless story. 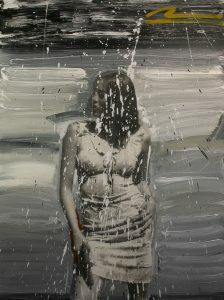 The totality of the background, or the field that surrounds the figure, is made up entirely of horizontal brushstrokes. This strict painterly scheme is however contrasted sharply by the formless spatter of paint spread across the center of the painting particularly and out toward the edges of the canvas. Control and abandonment here lives side by side and is through paint brought to bear upon the figurative content in a way that gives it added depth. The established tension tells of a threat of violent eruption that seems to belie the cool posture and demeanour of the girl holding the gun. “Girl with a Gun” is a particularly dramatic example of Romero’s treatment of paint. There are other examples where paint is allowed to be equally expressive but more joyful and captivating. 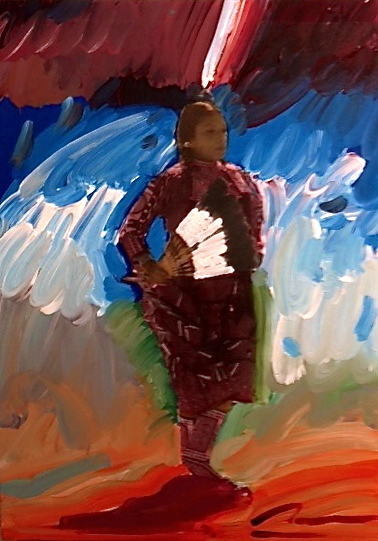 These kinds of brushstrokes are especially found in Romero’s Dancer series. More on that later. The photography sessions will continue and further excursions into Romero’s wonderful world of paint will be reported here. After a hiatus here on the blog we are back to proudly announce that Kiva is hosting a solo exhibition of the work of esteemed Cochiti Pueblo artist Mateo Romero. Romero gained recognition in the early 1990s for his Bonnie and Clyde painting series which depicted native youth at leisure. But as the title suggests, the scenes were often shot through with a dark undercurrent, touching on sensitive subjects such as domestic violence and alcohol abuse. Since then Romero has developed his technique to include photography into the painting process. The style creates a stark juxtaposition of each medium’s respective effects. 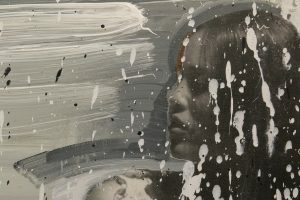 Photographs are scanned onto the canvas and the details of the photographic image are contrasted by Romero’s expressionistic brushwork, creating abstract lines of color around the portrait-like figures. The dynamic is particularly evident in the Dancer series, which depicts subjects engaged in ceremonial dances. The photos are static, yet Romero tries to capture the motion and spiritual elevation of the dances through swirling brushstrokes and bright colors. The exhibition focuses mainly on Romero’s mixed media paintings. The centerpiece, however, is a mixed media painting but with tar instead of photography. “Lonely Soldier” (2012) shows a silhouetted figure – it’s features completely blacked out – holding a raised rifle against a semi abstract landscape. It belongs to a series of paintings that takes the massacre at Wounded Knee as its theme. It is a powerful image but also a somber one. The way it plays with positive and negative space literally turns the potent figure into a black hole. While capturing a moment of proud struggle, the scene is also permeated with retrospective knowledge of the tragic outcomes at Wounded Knee. Most recently, Romero has returned to pure oil painting. 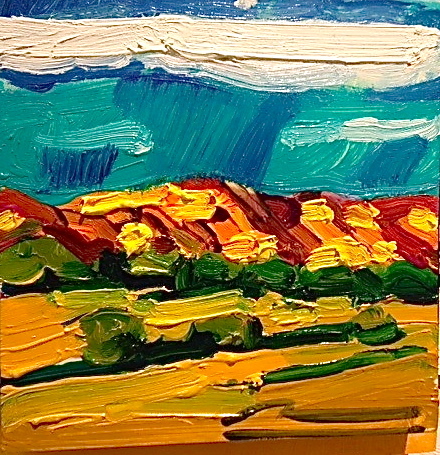 The exhibition includes three landscape paintings that verge on abstraction through broad, colorful and expressionistic brush work that infuses the scenery with a vibrant energy. In some paintings of his recent output, Romero has returned to the Bonnie and Clyde theme of his early paintings. One mixed media painting included in the exhibition bears the title “Girl with a Gun” (2012). It shows a stylish young woman in a short dress clutching a handgun against her bare thigh. Despite the seemingly violent subject matter, the impression one gets from the painting is not exactly hostile. While the source of violence is front-and-center, its’ importance is downplayed by how casually it is handled. The handgun has become just another object, almost a fashion accessory. Other images are more peaceful. In two of the paintings in the exhibition a woman sits posed in contemplative absorption whilst holding a piece of pottery in her lap. Like many other contemporary native artists, Romero’s art frequently emphasizes a connection to the past. In this light the pottery and the handgun may not be as far removed from each other as it may seem, but rather represent two sides of the same coin. Maintaining an authentic artistic tradition in the face of institutionalized marginalization is tantamount to an act of resistance; a resistance to being swallowed up by mainstream culture. And Romero’s art resists while immersing the viewer in a joyful dance of color and paint.